As opposed to that of quantitative research, qualitative research focuses on the factors rather than describing the numerical data. There is no single qualitative method, rather a number of research methods fall under the roof of qualitative methods. The various domains, especially social science disciplines often tend to have different conventions on the best practice in qualitative research. The selection of these (events, people, etc) must be theoretically justified. For example, it must be made clear how the respondent was selected. There must be a rationale for the sources of the data. For example, participants, settings, documents etc. Consideration must be given to whether the sources of data (e.g people, events, organisations, documents) were unusual in some vital way. Limitations of the data should be discussed. For example, the reason for non-response etc. Basically, a qualitative research paper includes: data collection and data analysis section. In the data collection section describe the methods you have used to collect data for your research paper. Such as survey method, observational or case studies approach. Include specific information pertaining to how many participants were present, the demographic information for each of the participants and how the information was verified. Interviews – Interviews can be further divided into individual & focus groups. Participant observation – This process ranges from mostly observing to participating. Open-ended survey – This process gives an opportunity for participants to give detailed answers. Data collection section should be followed by the data analysis section. The process of analysis should be made as crystal clear and transparent to help the readers gain clarity of the procedure you have followed. Describe the process of compilation of data, their organisation and how the conclusion was drawn.And also, how were the themes/concepts and categories generated from the data. For example, if you have organised focus group interview, mention how you have organised the interview, compiled the obtained data, and how you have organised the obtained answers. Now that you have learnt how to write a method section in a qualitative research paper, get your sleeves folded and get going. If need any assistance with the writing process, consult a team of writers offering affordable PhD thesis proposal writing service. Undoubtedly, a synopsis form an integral part of a thesis that defines the future course of actions taken for research. It ensures that the review committee gets a clear picture of the proposed research and spots the gap established. It helps in verbalizing the idea of the thesis. It helps you to focus and structure the thesis. This section states the core research questions and all the important background facts throughout the procedure. It must clearly state the purpose of the study. The title reflects the objective of the research. The title of the synopsis and title of the thesis shall be invariably the same. The title must include a creative or unique element and should not be either too long nor too short. Research consists of objectives and aims pertaining to the study problem. Usages of terms like “the first study”, “the only study”, etc. should be avoided. The problem being studied should be mentioned in precise and clear terms. The hypothesis can be formulated by understanding the problem, reviewing the literature on it, and considering other factors. A review of the relevant literature is another very important part of the synopsis. It shows the work done previously in the area of proposed research and assists in identifying various variables in the research project and conceptualizes their relationship. The survey, questionnaires, observation, case studies, portfolios, books, journals, periodicals, abstracts, indexes, directories, research reports, conference papers, online databases, the Internet, videos & broadcasts. This section includes the inference obtained, significant contributions of the research and shortcomings of the research. In the end, a synopsis contains a list of references and a bibliography written in a standard pattern. Each and every aspect such as the name of the author, publication year, title, the title of journal/series, page number needs to be included. The format for writing a synopsis varies from University to University and among disciplines. Above is the outline of how the thesis synopsis should look like. The synopsis is an important part of the thesis that cannot be taken lightly. It contains crucial chapters like literature review, research methodology, reference lists, with each having its own significance. If you the one reading this blog, it is likely that you are wanting to enroll for a PhD programme but still struggling with the topic selection for your PhD thesis. It isn’t as straightforward to find the most appropriate topic for your research as you may perceive it to be. But if you have the right attitude and the required patience, then surely you would be successful. There are a certain set of rules that you must follow if you want to ensure that you choose the right research topic. Before making the final decision, you must read a lot of dissertations that are linked to your subject or your key interest areas. It would familiarise you with different ideas and research styles. It would not only help you to zero down on a topic but also give you a multidimensional outlook and later help you to devise your research style. Make sure you look for a topic that interests. Listen to the advice of your professors but go with the choice that is entirely yours. Get back to old ideas. Check old resources you might have used any time in your graduation years and try to see if some evolution could be done on them. Consider several ideas rather than looking for that one perfect idea. At the initial stage, you must have a welcoming approach to even the craziest ideas. Think of as many ideas as you can. It would eventually bring you closer the topic you have been looking for your research. Before finalising on a topic, ensure that nobody has completed a similar research. Collect supporting arguments why your research matters. It would help to keep you convinced and at the same time to convince your supervisor and examiners at the later stages. Assess the need for resources and information for the research. Make sure you have done a thorough analysis of the needed resources and information for the entire research to be conducted and surety that you have access to all of that. Have a precise and succinct topic. Usually, researchers who begin their PhDs with over ambitious projects struggle at the latter stages. Have a flexible perspective to your main research question as it may change during the course. Be flexible as you can so that you can quickly adapt to new evidence. Take expert opinion with your supervisor while you are deciding as they can give you a practical perspective to the obstacles and challenges that may come at the subsequent stages, which you may not be able to anticipate. Listen to your heart and be ready to fall in love with your topic. Always know that, even after having decided the topic very cautiously, there would be moments when there would be a feeling of saturation and exhaustion with your topic. Do not feel dejected and know that it is common and part of the process. Ask any PhD student about their thesis experience, and he or she will have a story to tell about their thesis defense. More than the research project, it is the story of the thesis defense that can incite the most extreme kind (positive or negative) of the reactions. My personal experience to completing my PhD thesis was certainly similar to an amateur climbing a mountain for the first time. Life, since then, has been normal after being appointed as an assistant lecturer in a renowned university. The mighty “Everest” rose between my thesis proposal defense and my thesis defense. I do not know the reason, but some perception of my thesis proposal resulted in it being deemed insufficient by the review committee of my university. Although this felt like a “major” explosion for me, it turned out to be just a small “testing” explosive compared to what was to follow. Following the proposal rejection, my thesis defense was also failed, probably due to the quantitative nature of my research study, which basically comprised of statistical analysis of collected data from surveyed population of university students coming from low income or single parent homes. This should have effectively ended my pursuit of PhD credentials, however the review committee decided against it, subject to me agreeing to change my research methodology from quantitative to qualitative mode. The committee also decided that only Dr. Andrews can be my guide and mentor for my new research path. Luckily, Dr. Andrews agreed to work with me in this unforeseen scenario. Thanks to him (and perhaps my own desperate situation), we bonded well over the next 18 months and even thought me to be “exceptionally talented” to get through with my research. His profile as a strong advocate for PhD students and his chair experience made sure that I did not have to make any major “mindset” changes to attempt the research project. For the next 18 months, I worked hard on my qualitative methodology of research and ended up with a much better understanding of the research topic. Once the research project was completed, I had little trouble getting my research proposal approved. Following that, I worked on the project dissertation and felt more comfortable discussing my points with Dr. Andrews despite my statistical approach to problem solving. This time around, I was much more relaxed and prepared during my thesis defense, and even joked a few times with the committee members. All this (and more) is thankfully due to the mentoring and trust placed on me by the versatile Dr. Andrews. Are you feeling physically or mental exhausted with your daily academic work, or experiencing high levels of stress? You can relax as this is a part and parcel of any PhD course and cannot be avoided. 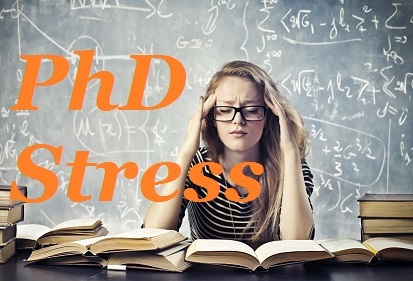 This is not to suggest that PhD stress is not real and damaging to your personal well-being, but to make you aware that you are not the only one experiencing it. At the same time, you must not ignore the warning signs of stress and try to keep working through it, as this will only worsen the situation. So, are you experiencing any of the following stress signs? General feeling of not belonging to the high standards of a PhD program. Remember that your PhD pursuit is a marathon race, and not a sprint. Slow down or take a complete break for a few days. Make a list of things to do and focus on the immediate things that have the highest priority. Breaking down a larger task into multiple subtasks can help you relax and reduce your stress. Prepare yourself for things to go wrong. Despite meticulous planning, things can go wrong at any stage of your PhD course. Do not blame this on yourself, as it has and will happen to the best of students. Engaging with the problem in hand and focussing always on the solution will ensure the success of your research project. Fear factor can be a major cause of stress. Fear can be at different levels. Are you fearing not being able to complete your PhD, or not being able to devote your time and focus on your PhD course? Understanding the level of your fear can help you in overcoming the same. Doing a PhD course does not mean that you have to make drastic changes to a healthy lifestyle. Do not deprive yourself of your normal sleep, and stick to a healthy diet and plenty of water. You can also seek stress-related help from your family or close friends. Most PhD students spend years of hard work in preparing and researching for their selected PhD project. Most of them also fall short when it comes to presenting the project thesis that can convey the depth of their research and their individual contribution to the solution of the original problem. In addition to its details, the PhD thesis must be able to state the problem with clarity, review the existing solutions to the problem, provide a critical analysis of the same, and finally detail the proposed solution to the problem. Your thesis must have a structure and flow similar to any research paper. Although the exact structure can vary depending on your subject, the outline structure of your thesis can include an introduction, related work, experiments, and conclusions. A publishable thesis can be the delight of any guide. To achieve this, you will need to plan for this from the time of subject selection. Question yourself if your conducted experiments are extensive to survive any independent scientific scrutiny, or if the data used for the research is valid. As an alternative to generic headlines in your thesis, provide headings that provide a glimpse of what your content can be. Regarding use of sub-headings, use appropriate section numbering and do not exceed more than 3 levels. In addition to the use of headings, the title of your thesis is vital to convey the extent of your research. Avoid using very short titles (for example, “Music Information Retrieval”), which sounds generic and does not convey much information of your research. Use appropriately long titles that indicate the scope of your research work. 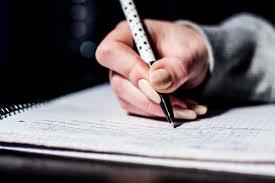 When it comes to effective writing, it is best to take the help of academic writing professionals who have the relevant skills and experience in preparing a complete thesis. An academic writer will be able to convey the depth of your research clearly using text and formatting. Review the quality of your thesis, which is likely to be examined by the panel of experts in the viva discussion. These experts will examine your thesis to check for completeness and overall quality, and to determine if presented data and analysis support the final conclusion. While choosing the right thesis topic is the first step in your thesis writing project, it is equally important to convince your professors to give you a go ahead on the topic. It is therefore essential to find a suitable thesis writing service that helps you frame your proposal in a way that it gets approved at the first submission. Once your proposal is approved, you can move ahead in the process of your thesis writing and save a lot of time. At PhD Thesis Writers, we hire talent that is professionally well-equipped and knowledgeable to guide you through your proposal writing. So, once you come to us for support with proposals for your thesis, you can sit back and relax as our writers assist you in writing a proposal that is perfect for your research design.